Waffling between 3.5 and 4 here. Having read this second book, I wonder if each is meant to hat-tip earlier, better known works. Mr. Mercedes focuses for a time on a car that creates massive carnage, and in Finder Keepers people fall victim to one man's obsession with the fate of a fictional character. The end of the book hints at the upcoming finale: telekinesis. If you've read enough King, you know what I'm talking about. 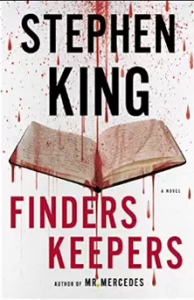 Getting back to Finders. You don't need to read the first book, but doing so enhances the picture of this New England community affected by bad times and bad deeds. Hodges and company come later into the story - this one belongs to Morris Bellamy, the disillusioned young man turned criminal after a confrontation with his literary idol; and Pete Sauber, a teenager in a low-income household who just wants his parents to stop fighting. Morris's crime allows Pete's family to survive, but once Morris has the opportunity to claim what he thinks is his, he wants everything back. I thought it was a good followup to Mr. Mercedes, and having read it I may have to rewrite my thoughts on the former. (You'll know why when the third book comes out) I liked seeing the relationship between Bill and Holly progress, and how the Saubers' story threaded into the history of the first book. One can see shades of Annie Wilkes in Morris, but this story isn't a rewrite of Misery.